Soak chickpea overnight or around 8-10 hours. Cook it for around 10 - 15 minutes and add salt, when it is 75% cooked. 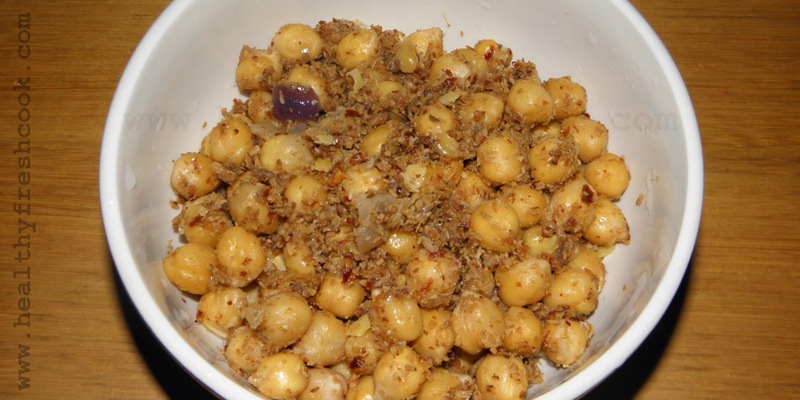 If you can cut a chickpea into two pieces using spoon indicates, it is the right time to add salt. Cook it for another 4-6 minutes until it is fully cooked (it should be in shape, but you should be able to mash it with the spoon or using your fingers). Drain excess water if there are any and keep that aside. Heat oil (or ghee) in a non stick pan and add mustard seeds and allow it to crack fully, then add all the masala ingredients and saute them for around 2-3 minutes until they turn slightly into golden brown. A nice aroma will come out from the coconut. Switch off the flame. Allow that to cool down and then grind the masala ingredients semi coarsely. Heat the non stick pan and add masala ingredients and chickpea (if you like you can add some shredded coconut as well) and mix all well. If you like you can grind the masala ingredients finely and add some extra shredded coconut when combing it with the chickpeas. We like little pieces of chilli and onion, so used to grind them semi coarsely. If you add salt when you start boiling chickpeas, it will take more time to cook. Always try to add required amount of water to cook chickpea. If you add more water, the excess water will also contain some nutrients and you will loose them when you drain it. If you had to drain excess water, then use it to prepare the chapatti dough or in any curry. Cooking time will vary with the type of chickpea and the soak time. If you use frozen chickpeas it will be ready in few minutes. You can cook chickpea using pressure cooker as well, which will save lot of time and energy. Pre-soaking the chickpeas before cooking will reduce the cooking time and only a little amount water-soluble nutrients in chickpeas will be lost due to reduced time of exposure to heat. Nutrition fact: Chickpea is a good source of protein, folate and zinc. I love to hear from you! Please share your feedbacks with me.